Your clan has left the ancient nomadic life and settled with 4 other clans in the valley. Once again the community has been successful in harvesting crops, and some families are getting better at raising animals. Who knows, when the children of our children will come to the world, which clan will rule this multitude? 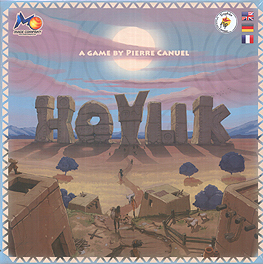 In Hoyuk each player represents a Clan during the neolithic period. You will erect a miniature version of the cities built in Anatolia more than 9500 years ago. The rules are simple enough but are hard to comprehend the full meaning until you actually start playing. Players represent clans building up their village, their families will assemble their buildings in blocks and adorn them with ovens or shrines maybe even pens. Each block will compete for rewards of Aspect cards which can be used to build more items for the family or kept to be spent as a set for points. Each round there is some catastrophe that befalls our emerging village and this cost may have to be born by more than one player.The turns are simple but the choices to be made are quite strategic, the game has 3 "modes" Basic, Middle and Advanced each one introducing more elements and scoring options into the game. The basic games feels quite solid and gives a gentle start to learn the game with. Once you have learnt the game I feel you should probably leap straight to the advanced game as it will provide many more options and some interesting additions to the game. Really good fun and I am glad this is now part of my collection.